There is perhaps nothing more personal than the relationship you have with your body. Love it. Hate it. Embrace it. Or reject it. The intimate relationship you have with your body, the one you walk around in, the one that encases your soul, is as complex and personal as it comes. Yet… it is also public. Unlike hair color, or eye color, which is noticed but carries no particular connotation other than a rational description of its physical attribute, your body’s physical weight and appearance holds a depth of emotional meaning far beyond a mere description of what your body’s outer shell looks like. Somewhere along the line, our body’s physical external appearance became associated with judgmental descriptors of our internal traits, values, worth, and character. People blindly assigned adjectives such as “lazy,” “slovenly,” or “anorexic” to people based solely on their body’s appearance. Somehow a door intrusively opened, allowing people to make grossly irrational judgments about a person’s internal self, based solely upon their body’s size, shape and weight. As a result, too many people, especially in our country, have come to feel compelled to overstep personal boundaries and to routinely make harsh, critical judgments about the body, shape, size, and weight of others. 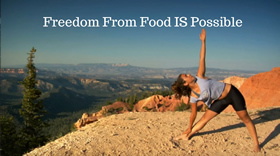 Something as personal as what a person puts in their mouth, how much they choose to move, or whether they have a thin or heavy frame, has become material for public fodder. And, too many people including our impressionable children, have fallen victim to labeling themselves with similarly harsh, unseeing, superficial judgment, based solely on their body’s weight and appearance. How a person chooses to treat their body, is their personal choice. A right that is so individual and so private, it should never be judged, assumed or criticized. The circumstances by which a body has come to its current physical state is a story to be read and understood solely by the inhabitant of that body, its storyline shared with only those given permission or the privilege to comment privately. Bodies come to be all shapes and sizes based on a complex interplay of genetic, physical, sociocultural and emotional processes. Many times, as I am privy to as a psychologist and eating disorder specialist, a person’s body was influenced by happenings a long time ago. Sadly and all too often, a person’s weight was the only means by which to feel protected or to gain control during unimaginable circumstances such as abuse, neglect, or emotional abandonment. Or sometimes, a person’s body size and weight have come to reflect a historical, and now chronic, use of food as the only means to comfort themselves, when no other nurturance was available. 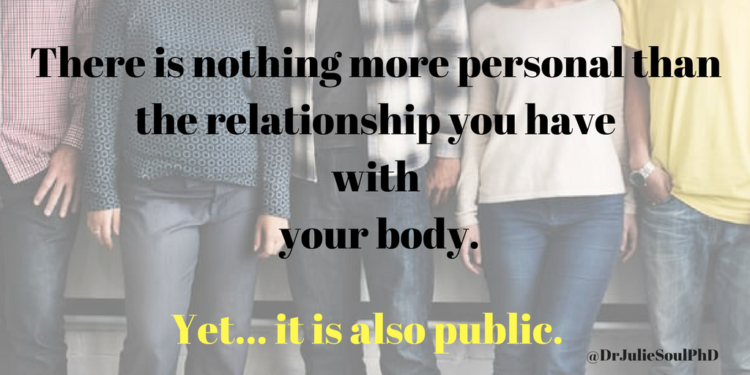 As we move into National Eating Disorder Awareness Week, amidst recent efforts to Embrace our body based on Taryn Brumfitt’s inspirational body image movement, my hope is to remind us all that a body is a very public, visible display of a deeper private story. The history, coping mechanisms or preference of the person’s inner soul is to be valued and loved regardless of the physical consequences of their behavioral attempts to survive.